Google has made discovering subject matter blogs easier by pushing their Blogs search results tab to the left rail of search results pages. 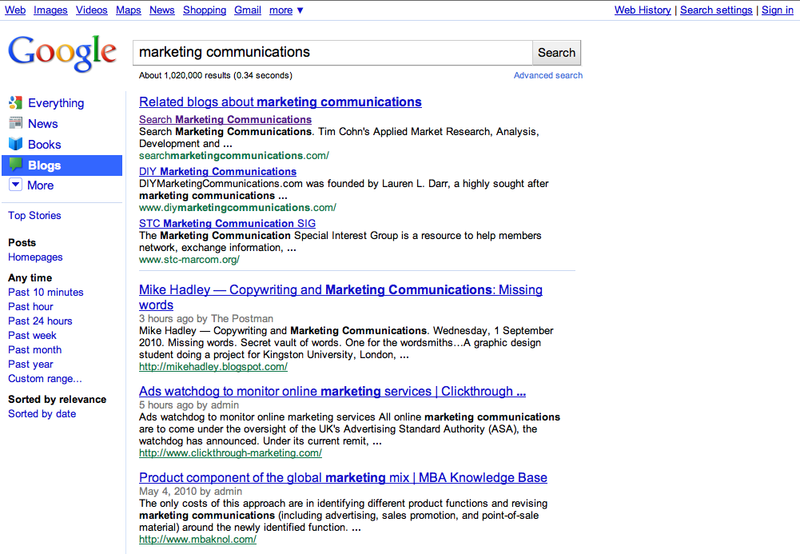 Clicking Blogs produces a list of blogs relevant to the keywords searched. It appears my Search Marketing Communications blog has somehow been hardwired into the first slot in the above the fold Google search results for “Related blogs about marketing communications”. This entry was posted on September 1, 2010 at 2:58 pm and is filed under Blog, Blogs. You can follow any responses to this entry through the RSS 2.0 feed. You can leave a response, or trackback from your own site.